What is the PCL knee ligament and what is the importance of having a healthy PCL ligament? PCL knee ligament is one of four major knee ligaments that hold the knee joint together, allowing us to walk or run. PCL ligament crosses with the ACL ligament preventing our knee from moving back and forth, while the other two ligaments MCL & LCL are located on the inside and outside of the knee preventing it from moving left or right. PCL ligament injury is not very common, but it does happen whenever there is forceful flexing of the ligament or sudden twisting of the knee. During sport games like soccer, PCL injury is suffered when the player is fallen upon or tackled, causing forceful bending to the knee. Landing on an already bent knee is another way to get the PCL ligament injured. In rare cases PCL tear can happen when straightening the knee beyond the normal limit. PCL injury can range from mild PCL knee sprain to a more severe complete tear of the PCL ligament and will most likely require surgery to heal properly. Most important thing any athlete can do whenever there is even a slightest chance that a knee injury may have occurred, is to immediately STOP PLAYING. Staying on the field, even with a mild knee sprain, can lead to a more long term injury to any of the knee ligaments. STOP PLAYING and sub out. Immediately apply ice on the knee and see a DOCTOR. It is important to treat any type of PCL knee injury, without treatment the athlete runs the risk of having knee problems later on in life as it never properly healed the first time. It is very common that other knee ligaments get injured at the same time that PCL knee injury occurs. Instant pain at the time of injury, which over time may also be felt in the calf region. Swelling to the knee area within the first 10 minutes. This is because injured PCL will bleed a lot, causing the knee to immediately swell up. Difficulty walking after the injury happens as the knee joint may feel loose and giving away. Degree of instability will depend on how severe the injury is. Pain is felt with bending of the knee. PCL knee ligament injury can be a mild PCL knee sprain, partial PCL ligament tear, or a complete PCL tear. PCL sprain and PCL partial tear is treated without surgery, however complete PCL ligament tear will have to be assessed by a professional doctor for full knee damage assessment, and surgery may be required. It is very difficult to assess a more severe injury, because other knee ligaments may be injured as well. This is why PCL injuries that are more severe should be assessed by a professional doctor. Doctor will compare the uninjured knee to the injured one, and depending on the initial assessment, Doctor can decide weather an X-ray, MRI or Arthroscopy needs to be done in order to assess the knee damage fully. All knee injuries are classified into Grade I, Grade II and Grade III. Grade I PCL ligament injury occurs when the ligament fibers are stretched beyond their limits, tearing less than 10% of ligament fibers. There is little swelling and tenderness felt in the knee. Athletes knee should NOT feel unstable with grade I PCL injury. Treatment for Grade I PCL injury will be RICE method (Rest, Ice, Compress, Elevate) for accelerated healing. Athlete should take a 2-4 week break from any activity that involves running, for full recovery. Grade II PCL knee injury occurs with stretching of the PCL knee ligament beyond its limit, causing partial tear to the PCL ligament (more than 10% of ligament fibers are torn). Pain and swelling to the knee area is to be expected. Knee will feel unstable, like it is giving out. Treatment will include RICE (Rest, Ice, Compress, Elevate) to accelerate healing process. Strengthening exercises to strengthen and return mobility of the knee. Athlete should take 4-8 weeks off from participating in any activity that involves running. Seeing a doctor is recommended to assess full extent of the injury. Grade III PCL injuries are suffered when the PCL ligament is completely torn. Major symptom for torn PCL will be instant pain and swelling to the knee. Knee will feel unstable, and knee movements will be hard to control. Treatment for major PCL tear may have to be surgery, followed by PCL knee rehab after the surgery. 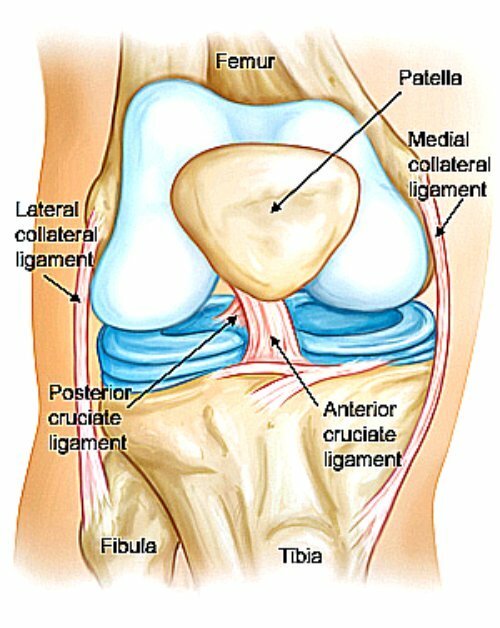 In most cases, complete tear of the PCL knee ligament will also injure other knee ligaments as well. Treatment and recovery will last 12-24 weeks (3-6 months), or longer. Doctor should be seen as soon as possible for full assessment of the injury. Performing surgery will require several months of PCL rehab afterwards. RICE (Rest, Ice, Compress, Elevate) right away after injury occurs. Use crutches or knee immobilizer to keep the knee still for the first few days after PCL injury. Knee treatment will depend on many factors such as how much of the PCL ligament is torn, are there any other parts of the knee injured, how active you are, health, age and how long ago the injury occurred. PCL injury chance can be reduced greatly, by simply stretching and warming up before every activity. Any knee injury can be serious in the long run, so I strongly recommend seeing a doctor to assess the full extent of the injury and recovery treatment. For more information about PCL knee injury visit Posterior Cruciate Ligament - PCL Injury.